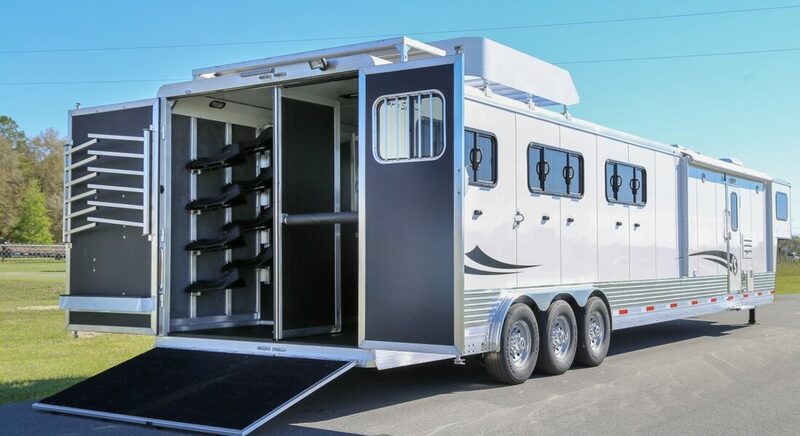 If your looking for a quality manufactured top of the line living quarters horse trailer, look no further. Here at Shadow, we know what is important for the comfort of your stay. We have a variety of floor plans that range from 7’ to 25’ 6” short walls and range from 6’ 4” wide, 6’ 9” wide, and 8’ wide to meet your specific needs. Shadow’s interiors are assembled and installed right here in our Williston Florida factory. From our handmade cabinets to our custom showers, you will feel right at home in your home away from home. Here are some features of Shadow that you will not find anywhere else. Showers- Large one piece fiberglass showers. Advantech Subfloor- 20 year warranty against mold and rot. Easy Glide Slide Out- Light weight, manual-slide out with a couch that folds down into a full size sleeping area. King Size Bed- Get the best night’s sleep with plenty of room, wake up feeling refreshed. Easy Glide Slide Out– Light weight, manual-slide out with a couch that folds down into a full size sleeping area. King Size Bed– Get the best night’s sleep with plenty of room, wake up feeling refreshed. Quick Recovery Hot Water Heaters– For the best shower. Showers– Large one piece fiberglass showers. Porcelain Toilets– Easier to clean and last longer. Styrofoam Insulation– Best insulation against hot & cold weather. Advantech Subfloor– 20 year warranty against mold and rot. STANDARD: INCLUDES CASING CHAIR RAIL, CABINET DOORS, SLIDE TRIM WOOD VINYL WRAPPED CABINETS *NOT AVAILABLE IN WALNUT OR HICKORY (NO VINYL MATCH). PREMIUM: INCLUDES CROWN MOLDING, CASING CHAIR RAIL, CABINET DOORS, SLIDE TRIM, SOLID WOOD CABINETS (AVAILABLE IN ALL BUT CHERRY). *NOTE: ITEMS MAY VARY BY MODEL. PLEASE VERIFY WITH MANUFACTURER FOR CLARIFICATION. The Popular “Stablemate” Bumper Pull and Gooseneck Models are now available as a Living Quarter Model. The “Not so Small” Stablemate Living Quarters can be pulled by a properly equipped 1/2 Ton Pick-Up Truck. This All Aluminum Trailer is lightweight, affordable and with the innovative Shadow “Slide-Out” for a more comfortable living space. The “Stablemate” models may be light and affordable, but still feature a quality All Aluminum frame with floor cross members on 1′ centers and interlocking aluminum floors. 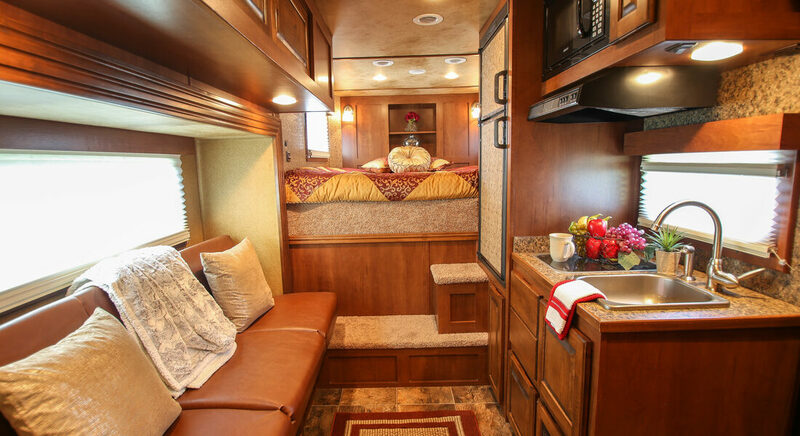 Safety and Quality make the Lightweight Stablemate Living Quarters a popular choice for those who want a cozy and comfortable living area. The Stablemate Living Quarters may have somewhat fewer options, but all the necessities are included. And with the available sofa bed slide-out, the living area becomes a comfortable place to relax, rest, and recover. 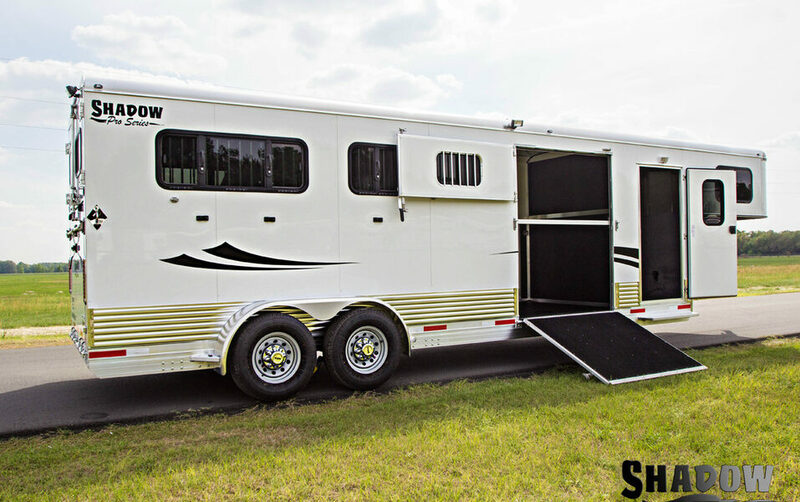 When Shadow designed the Pro Series Trailer, we had the professional horseman as our focus. Our goals were to provide the industry with the best quality, best designed and light weight trailer at the very best value. We feel we accomplished these goals. Our trailers are the most practical, functional and best pulling trailers in the industry today. 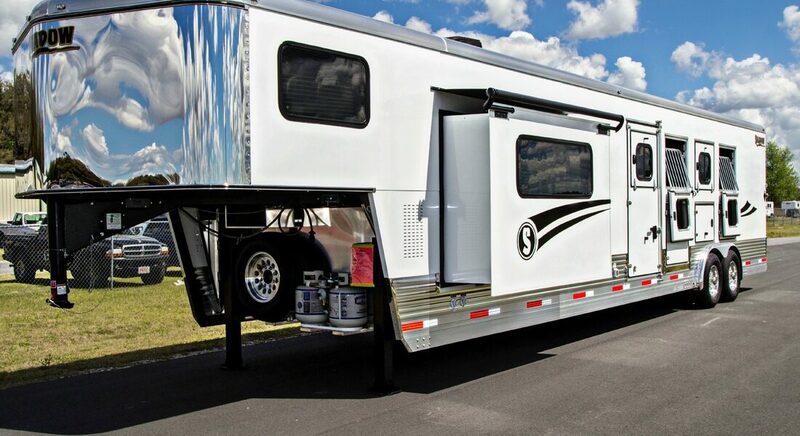 Here are some key features of our Pro Series Model trailer. Shadow’s Pro Series models have been tested by time and literally hundreds and hundreds of great horsemen and horsewomen. Among them include Hall of Famers like Austin Shepard, Jody Galyean, Randy Wilson, Tom Lyons, Kobie Wood and clinician Pat Parelli who have all pulled the Pro Series Models well over a million miles over the years. They have entrusted their great horses to Shadow Trailers to make a safe, sound and healthy experience while traveling to every event. The Pro’s know there is a difference and we thank them all for believing in us.